Welcome to North American Coating Solutions, home of the best epoxy floor installers Michigan has to offer. We provide an assortment of custom flooring solutions for businesses large and small, from simple concrete repair to industrial floor coating installation. Take advantage of our residential, industrial and commercial flooring installation to improve your work space and reduce your maintenance requirements at the same time. We offer a 5 year guarantee on our workmanship, so your satisfaction is 100% guaranteed! 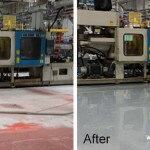 To learn more about our epoxy floors, concrete repair services, and other industrial flooring solutions, contact North American Coating Solutions at (586) 226-9416. One of our knowledgeable flooring installers will gladly answer your questions. Easy Maintenance and Easy Installation – The Epoxy Goes Right Over Your Existing Concrete Floors! Trust in our industrial floor contractors to enhance your flooring today. Call (586) 226-9416 for your free quote from our family owned and operated flooring company. What Makes North American Coating Solutions The Best Industrial Flooring Installer In Michigan? Our commitment to excellence and our genuine concern for our customers have kept North American Coating Solutions at the top of the pack for years now. Our industrial flooring clients come back time and time again because they trust our tested and proven epoxy floor coatings. Contact us today to see what we can do for our business.